The Incredible Melting Man is one of those science fiction schlock classics that seems to have grown in estimation among its audience since its original release, thanks mostly to home video and horror conventions. William Sachs directed the film in 1977 and it eventually became a cult classic, mostly because of how unintentionally funny it is, but also because of its make-up effects. Produced by American International Pictures, the film itself was meddled with during the production and during post production. Director William Sachs intended for the film to be satirical, but was forced by the producers to make it more horrific. Most of the intended comedic scenes were edited out after the fact, and as a consequence, it was received very negatively by the public at the time. To be fair, this isn’t a good movie, but it was made with the right intentions. The great make-up artists Rick Baker and Greg Cannom both worked on the film (as well as Rob Bottin), and it shows. The make-up effects are the star of the show really, especially for special effects artists today who saw the film when they were children and were influenced by them. The main problem with the film is that it tries very hard to be so many different things at once. Sometimes there’s horror, comedy or action, but there’s this feel to it that doesn’t encourage you to be swayed in one direction or another. As a result, none of it really works. I suppose if you were a small child and saw this film it might scare you, but as a teenager or an adult, it falls flat. Both the acting and the dialogue being spoken are terrible and sleep-inducing most of the time, so whether it has good make-up effects or not, you can’t find a firm foothold and be on the same page as the film. On the other hand, if you go into it with a different frame of mind, one of wanting to laugh at it, then you’re likely to enjoy it much more, which is pretty much how I view it. I appreciate the special make-up effects, but the rest of it is just funny to me. It’s a shame that William Sachs didn’t get to make and release the movie that he originally set out to make, as it might have been more effective, but I have a sneaking suspicion that it wouldn’t have been. 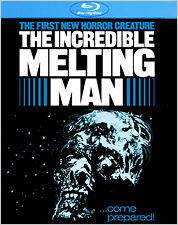 The Incredible Melting Man is definitely a guilty pleasure, but I don’t think it could have been saved in editing. As for the film’s Blu-ray transfer, courtesy of the Scream Factory label, it’s surprisingly very good. There are moments during the film where stock footage was used, which is much softer and doesn’t have as much detail, so I’ll ignore those bits. The rest of the film looks great. There’s a very fine amount of detail on display with a nicely distributed amount of grain, colors are well-saturated and textured, black levels are very good, but not perfect, and both brightness and contrast are also very good. The movie was shot on a low budget and it shows, but as a representation of the film’s look on a negative, this transfer works quite well. The soundtrack, which is an English 2.0 DTS-HD track derived from the original mono soundtrack, is about what you would expect from a film of this caliber. It’s adequate, but nothing to write home about. Dialogue is clear and understandable, and both score and sound effects are fine. It’s not an overwhelming soundtrack, but it gets the job done. And there’s not much more to it than that. There are also subtitles in English for those who might need them. The extras are pretty short and sweet, but entertaining enough to warrant them. There’s an audio commentary with director William Sachs, an interview with make-up effects artist Greg Cannom, another interview with both Sachs and make-up effects artist Rick Baker, theatrical trailers, a photo gallery, and a radio spot. As a sidenote, I think it’s great that the original ad campaign was hung on Rick Baker’s involvement with the film, even though he wasn’t as big a name as he is now. When you get right down to it, The Incredible Melting Man isn’t a great film, but it’s a guilty pleasure of an odd sort. Like I said before, it’s more of a point-and-laugh-at movie nowadays more than anything else, and if you’re into that sort of thing, or if you’re interested in some less-than-savory cinema, then this Blu-ray release of the film is for you.